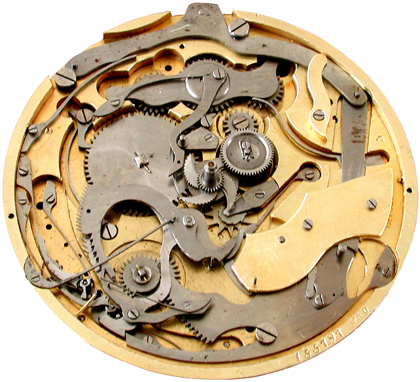 Minute repeater mechanism in a goliath watch, circa 1900. Signed "J. C. Vickery to their Majesties 177 to 183 Regent St W" and probably made by Amedee Douard, Switzerland. There are also three videos of repeaters to help with understanding the mechanisms. Illustration: Minute repeater mechanism in a goliath watch, circa 1900. Signed "J. C. Vickery to their Majesties 177 to 183 Regent St W" and probably made by Amedee Douard, Switzerland.